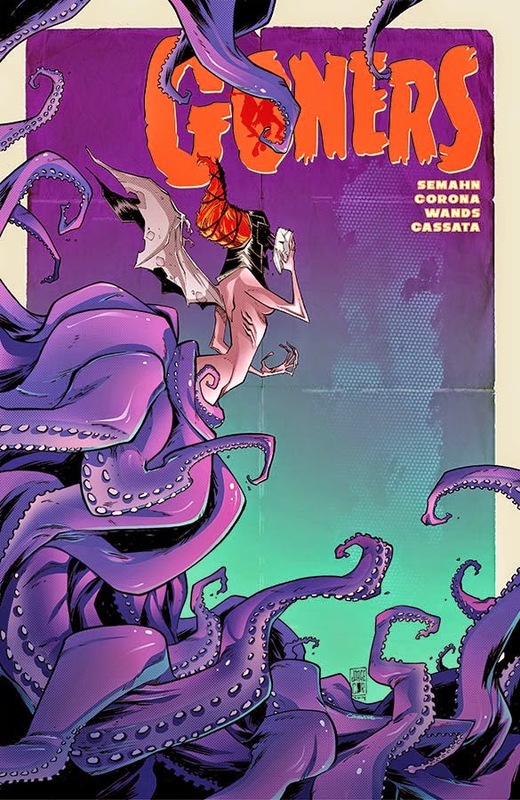 When Goners launched the creators hoped to bring a fun and suspenseful adventure influenced by their of love of horror and fantasy. At issue six, they've not only met their goals but surpassed any expectations in making Goners a bonafide thrilling supernatural series. The first arc wraps up in a crescendo of action which has been the series staple from issue one. A frenetic joyride with more twists than a pretzel. To say the Latimer family would be forever changed when the series began is an understatement. The world renowned guardians against the evil forces of the supernatural were murdered before a live audience and nothing was the same ever again. The remaining Latimer children, Zoe and Josiah, had to grow up in a hurry and fend for themselves with little help and by the end, as Latimers always do, stood up to the monsters that threatened the world as we know it. It's a credit to the creative team of Jacob Semahn (writer), Jorge Corona(artist), Steve Wands (inker/letterer), and Gabriel Cassata (colorist) of the high-level of quality sequential art Goners not only put out every month but did so consistently. It felt like a story that was bursting to be told by a passionate team of artists because it felt fully formed with charming characters and gnarly ghouls. This arc will be collected in a trade and is probably the best way to experience the speed at which the story unfolds and keeps you on the edge of your seat. Zoe and Josiah had lost so many loved ones only to be captured by Josiah's real mother, a succubus named Seph. When all seemed lost it was Josiah's intellect and bravery that saved the day. It would not come easy and perhaps not at all without the tenacious support and guidance by his loving and equally brave sister Zoe. It was this dynamic that is at the heart of the series. Brother and sister fighting for survival and for each other against immense odds. The theme of family carries through in flashbacks that detail the history of the Latimers and their on-going battle against the things that go bump in the night. When Josiah visits the afterlife for a moment he visits with his late father, and even though some uncomfortable information becomes evident it becomes part of his growth and understanding of what it means to be a Latimer. It's human moments amid the frenzy of monsters and black magic we find a beating heart and characters we care about. Goners pays homage to "kids in peril" stories that go back as far as Grimm but really share a lineage with Goonies and Gremlins. Young people dealing with precarious situations and facing them head on despite fear and danger. You can't help but root for Zoe and Josiah. And when things go completely bonkers they step up against all odds to defeat demons risking life and limb for one another and for all of us. It's as much an homage to the kid in all of us. I used to wrap a towel (against my mother's wishes) around my neck and hold a broomstick like a sword slaying imaginary dragons or wielding a stick like a lightsaber defeating the dark side. Semahn and company tap into our subconscious and take us back to our younger selves before the weight of the world squeezed out any childlike wonder from our souls. Goners is that adventure we always yearned for to save the world and become the hero in our mind.